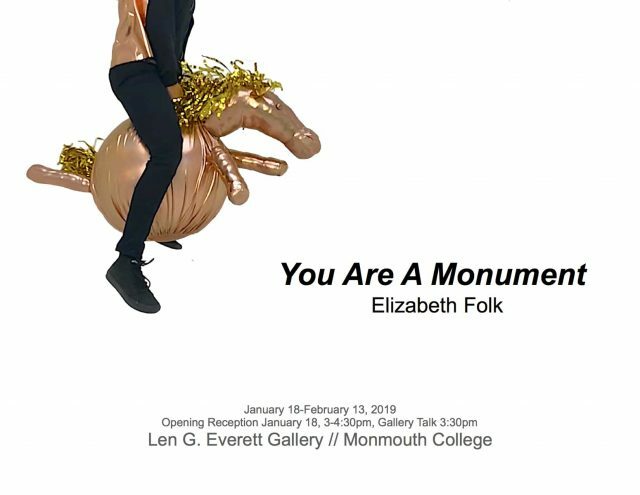 For California artist Elizabeth Folk, whose work will go on display this month at Monmouth College, the creative process comes down to answering a series of questions. “Does it look like art?” she asks. If the answer is “Yes,” her reply is to start over. Among other questions: Is her creation interactive? Does it start a conversation? Is it humorous? Is it revolutionary? On the exhibit’s opening day (January 18), Folk will be on campus for a gallery reception from 3-4:30 p.m. She will give a gallery talk at 3:30 p.m. The exhibit, reception and talk are all free and open to the public. An assistant professor of studio art, Folk teaches at California Polytechnic State University in San Luis Obispo, Calif.
“In a society where we spend much of our time in capsules traveling from capsule to capsule, I have realized that most of my art belongs somewhere between the capsules – a special delivery for you during your long day, should you choose to accept,” said Folk. The Everett Gallery is open during library hours: 7:30 a.m.-midnight, Monday-Thursday; 7:30 a.m.-5 p.m., Friday; 9 a.m.-5 p.m., Saturday; and noon-midnight, Sunday.